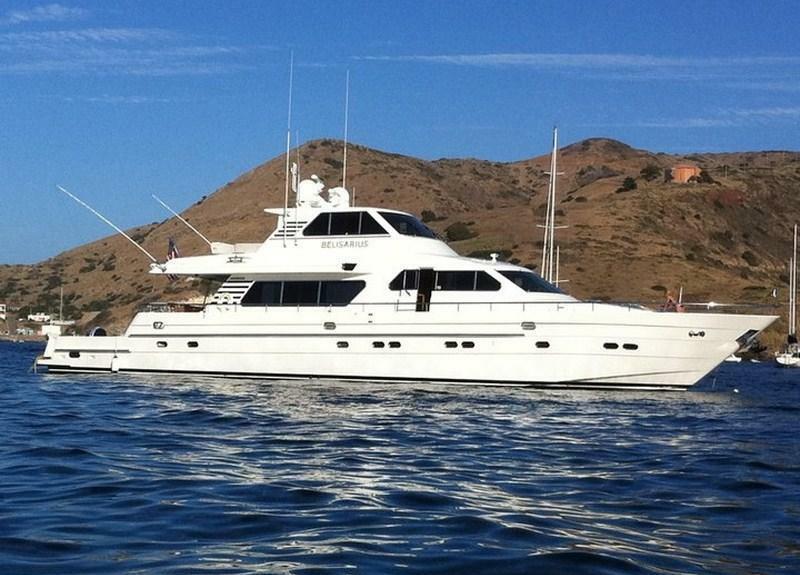 BELISARIUS was built by Horizon Yachts of Asia in 2001 and measures 28m, (92ft). 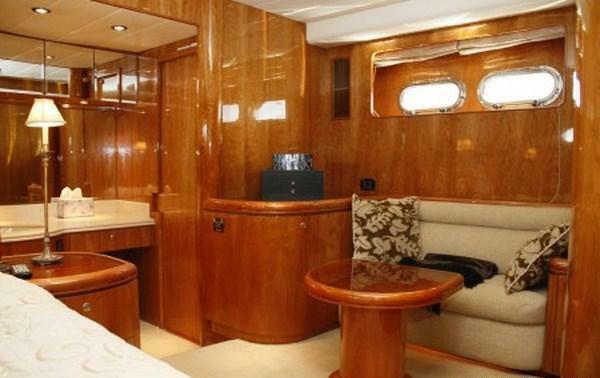 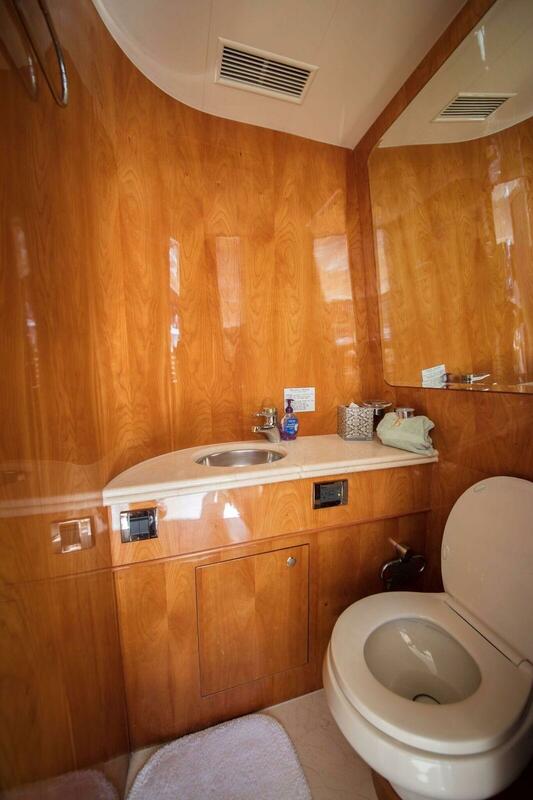 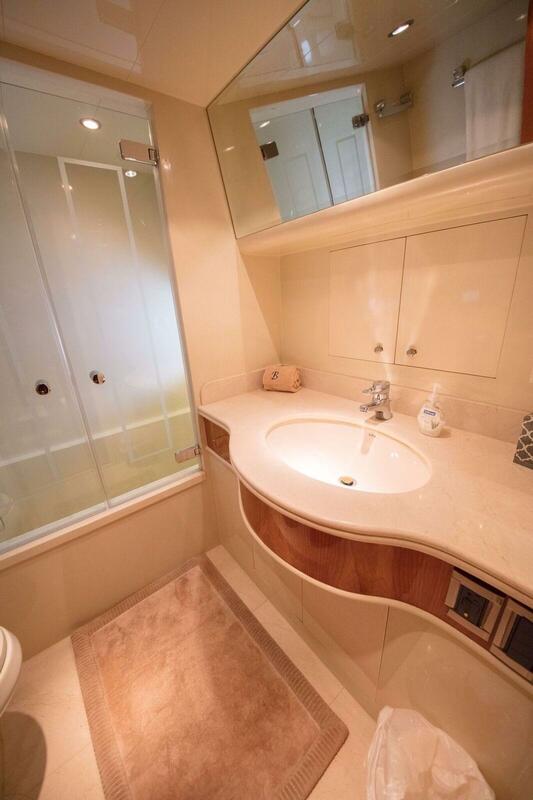 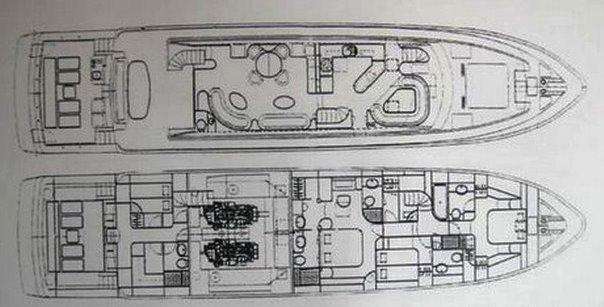 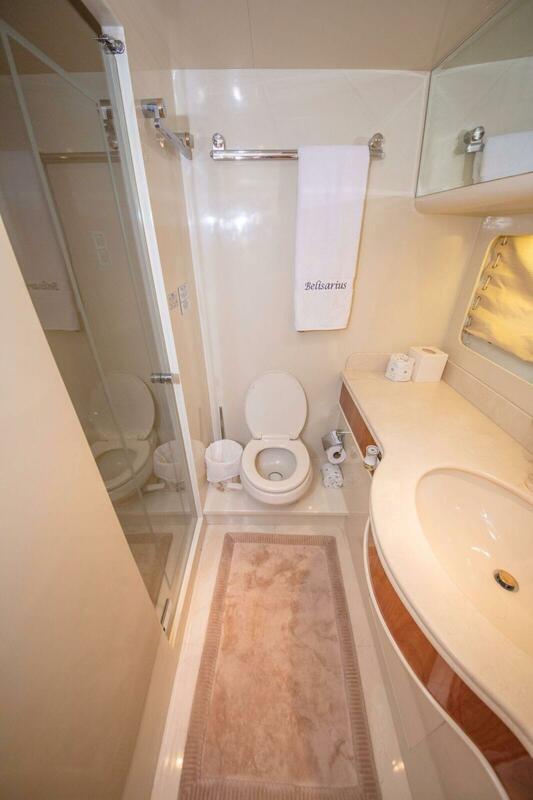 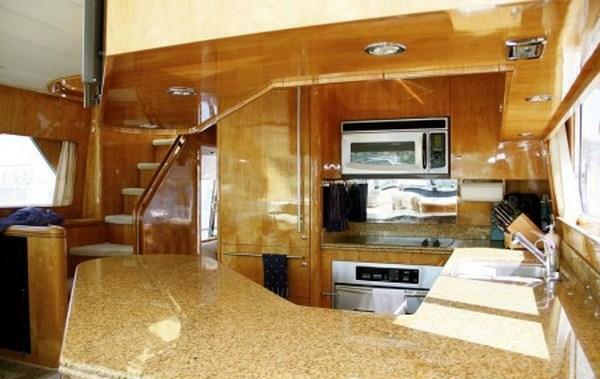 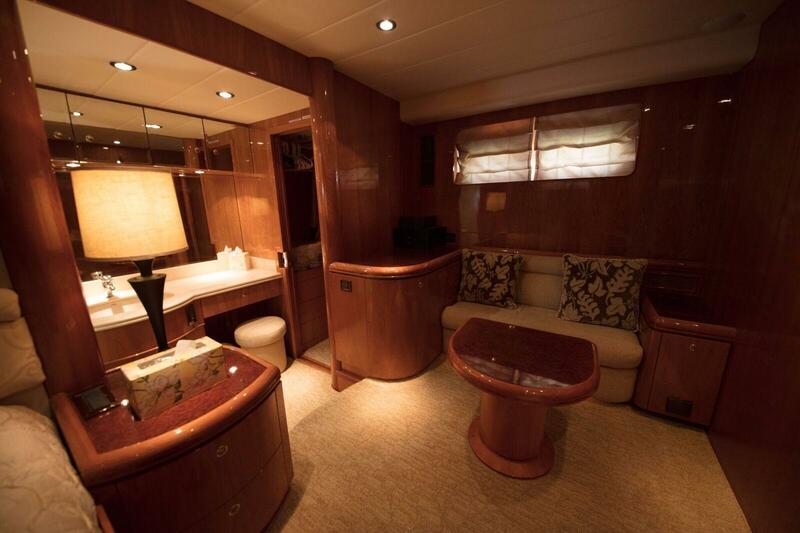 She accommodates up to 6 guests in 3 en-suite cabins. 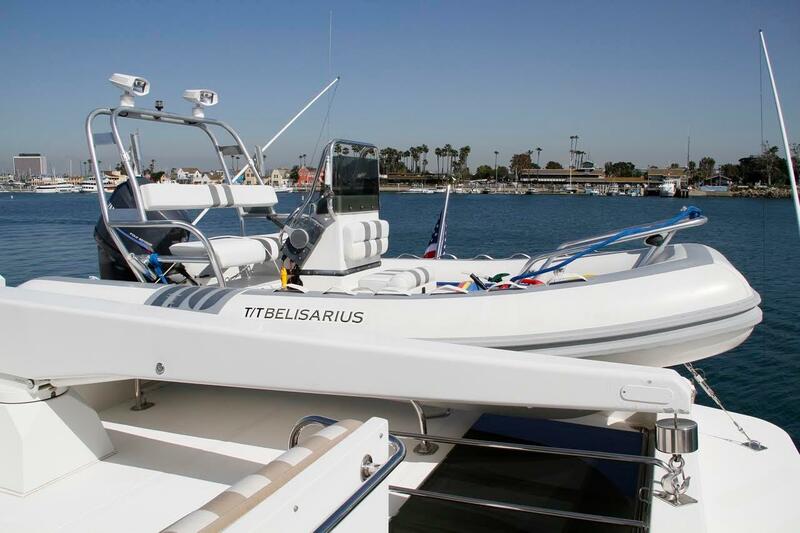 She is the ideal choice for keen fishing enthusiasts with 2 fighting chairs, outriggers and further fishing equipment. 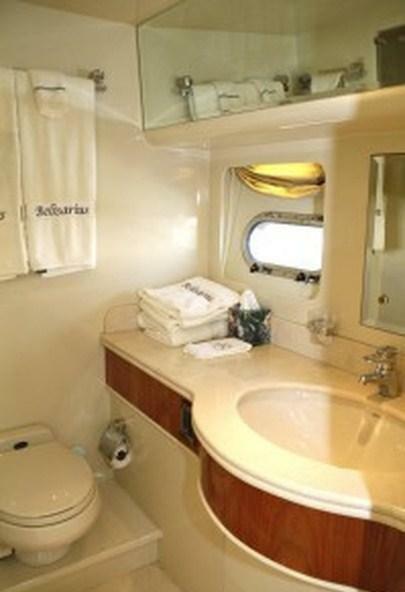 BELISARIUS has a light and neutral interior with a minimalistic yet inviting décor. 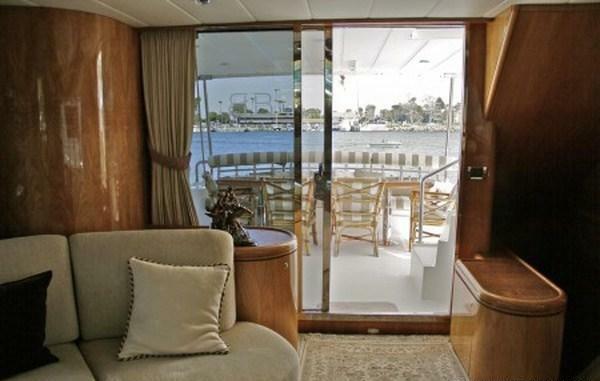 The salon is surrounded by large windows providing ample natural light. 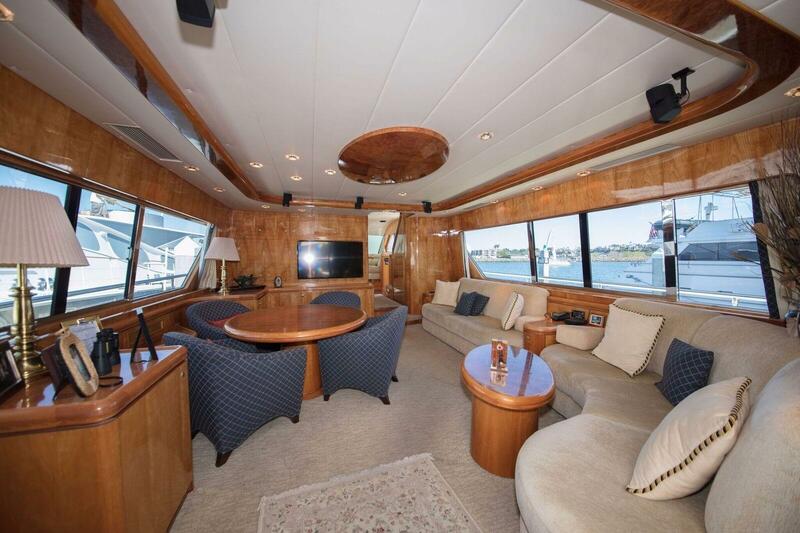 On the starboard side a 2 comfortable cream sofas invite guests to relax, to port a casual cocktail table is ideal for games and evening aperitifs. 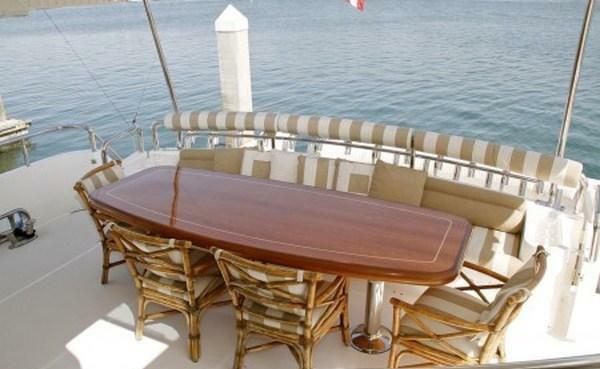 Forward and separate of the salon, the galley boasts a country style kitchen and dining table forward, the dining table benefits from being slightly raised and therefore features optimum viewing. 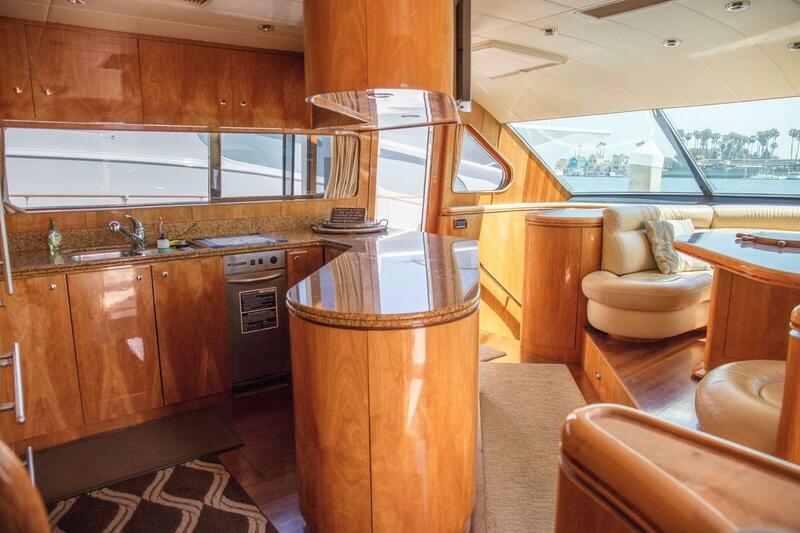 BELISARIUS offers further indoor areas to relax in the sky lounge, accessed from the country galley, it offers comfortable seating and idyllic viewing. 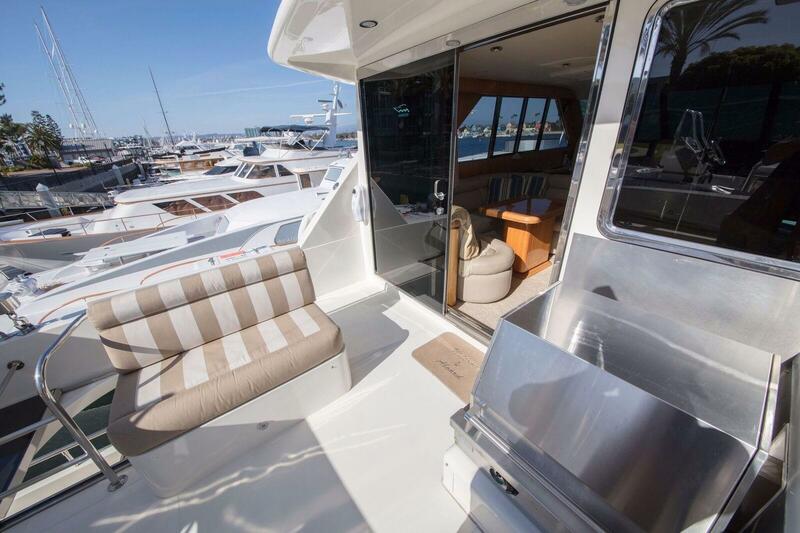 Exterior deck space aboard is generous. 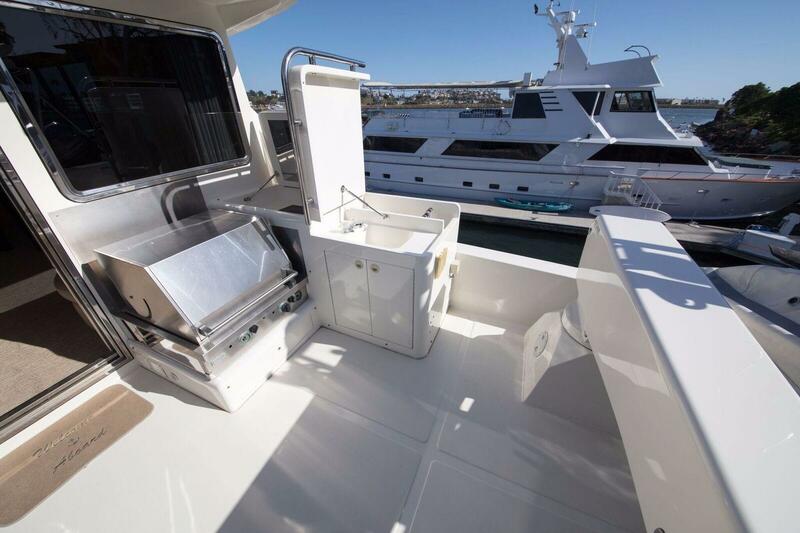 The aft deck offers a shaded alfresco dining option, followed by a lower extended fishing deck, further aft, a swim platform makes water access easy. 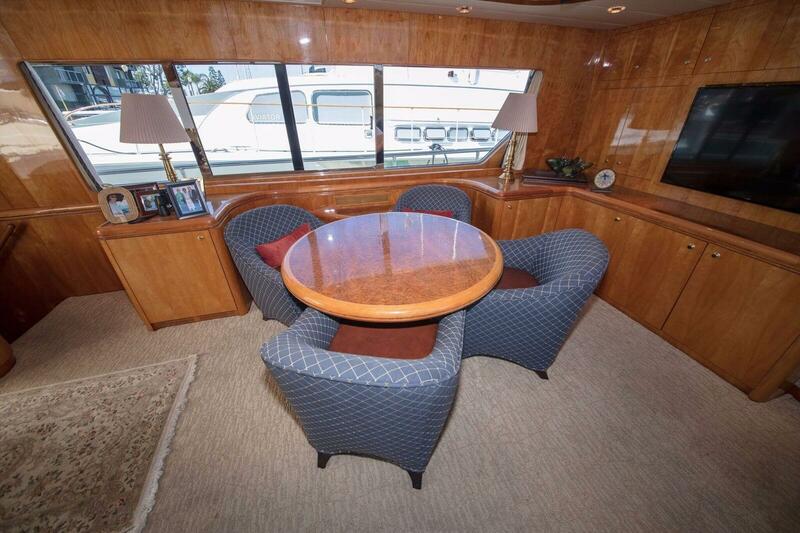 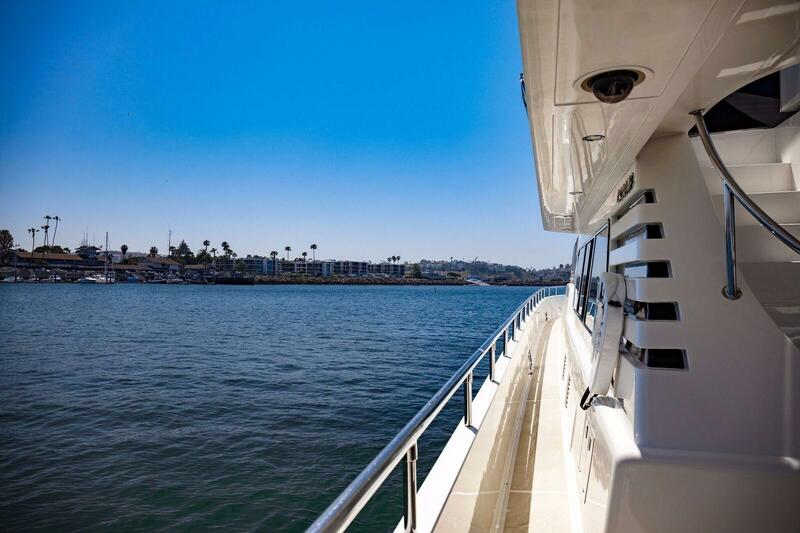 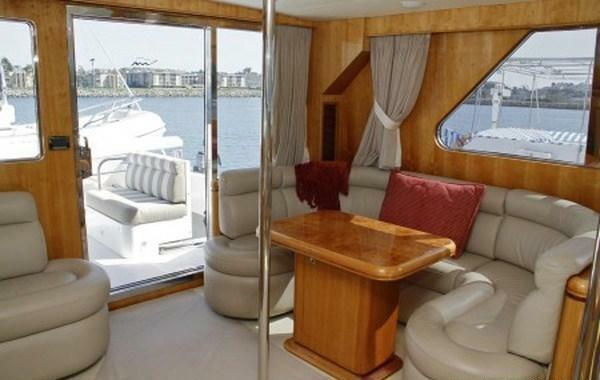 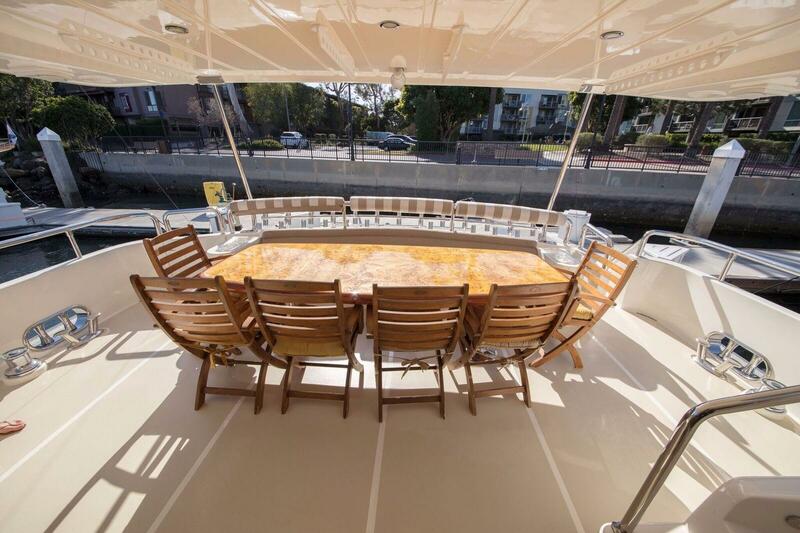 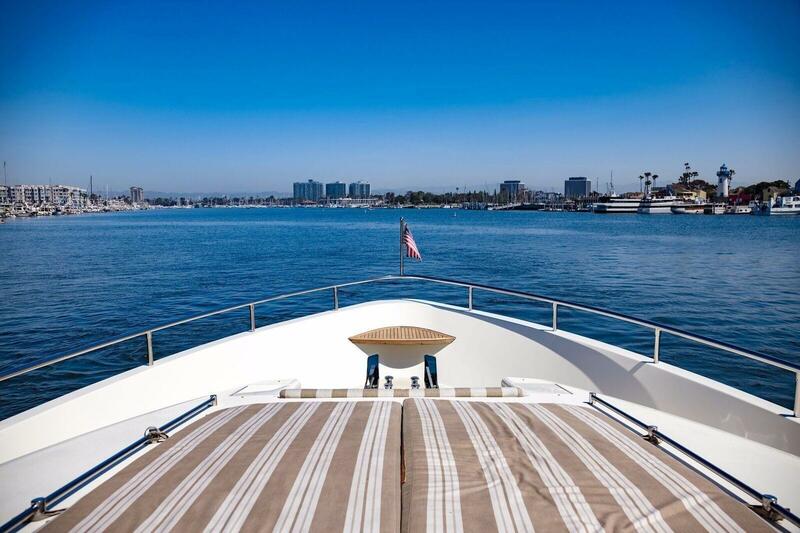 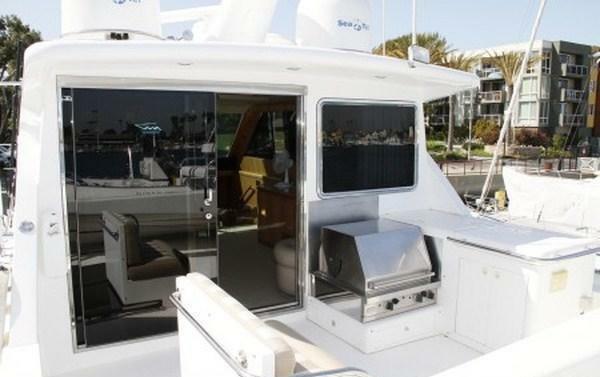 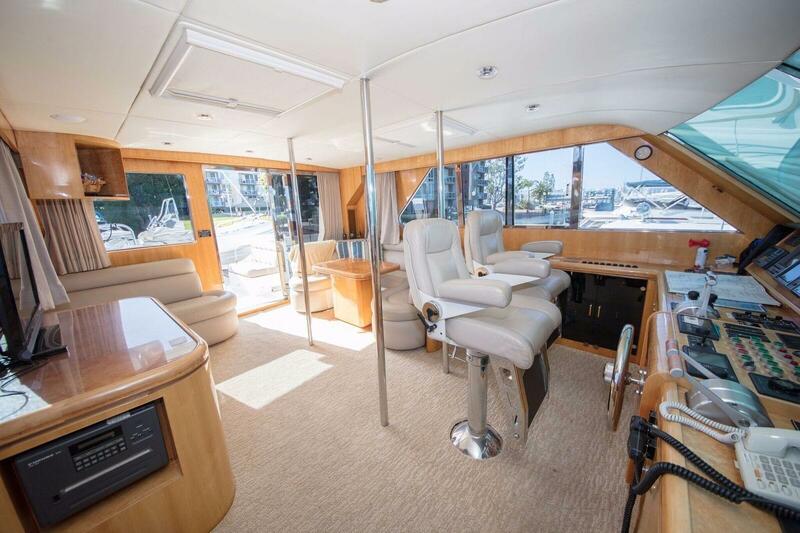 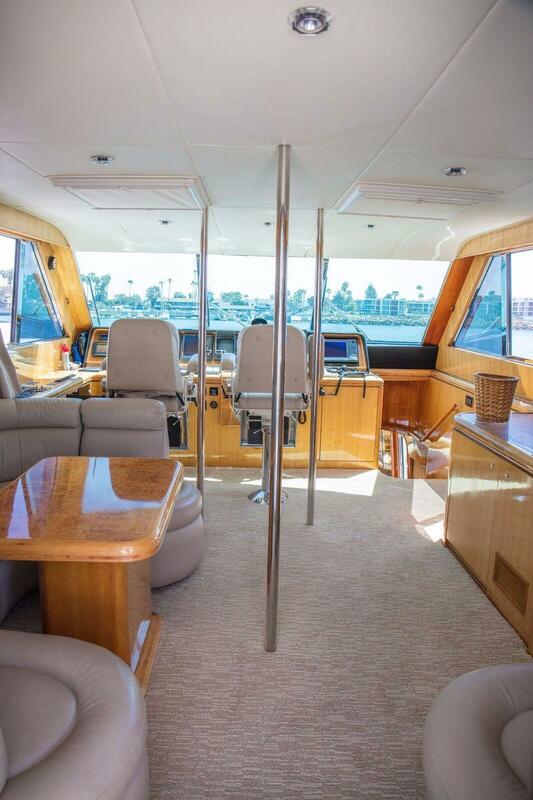 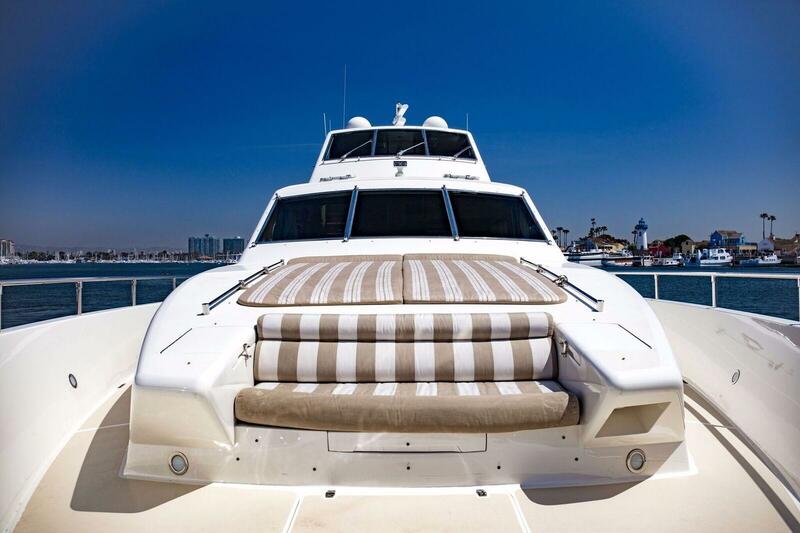 On the foredeck, enjoy the double sunpads and seating area for an intimate escape. 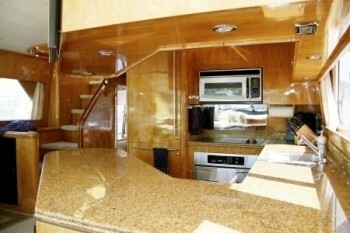 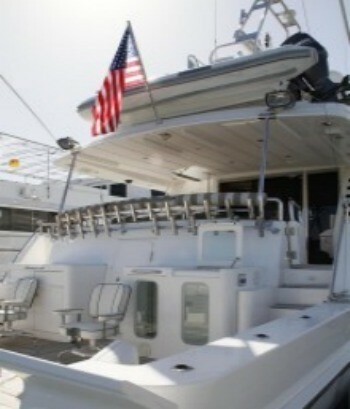 Aft of the skylounge on the upper deck, a sundeck boasts seating, sunning space and a BBQ grill. 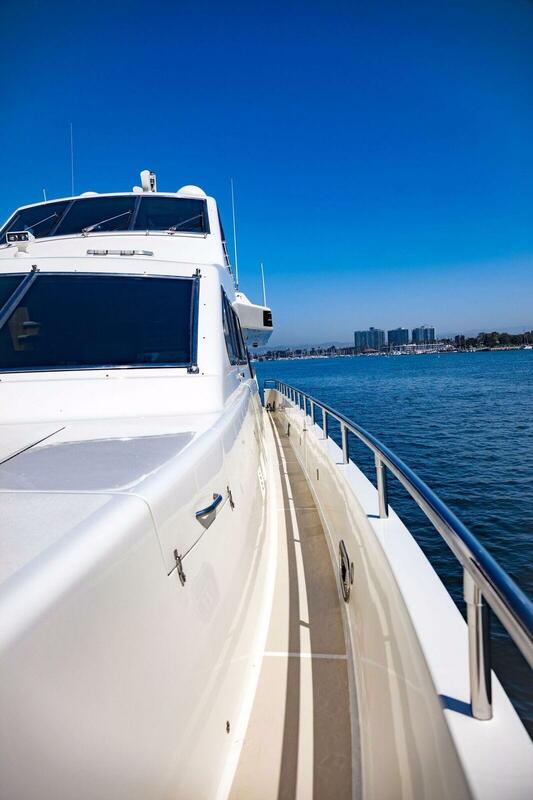 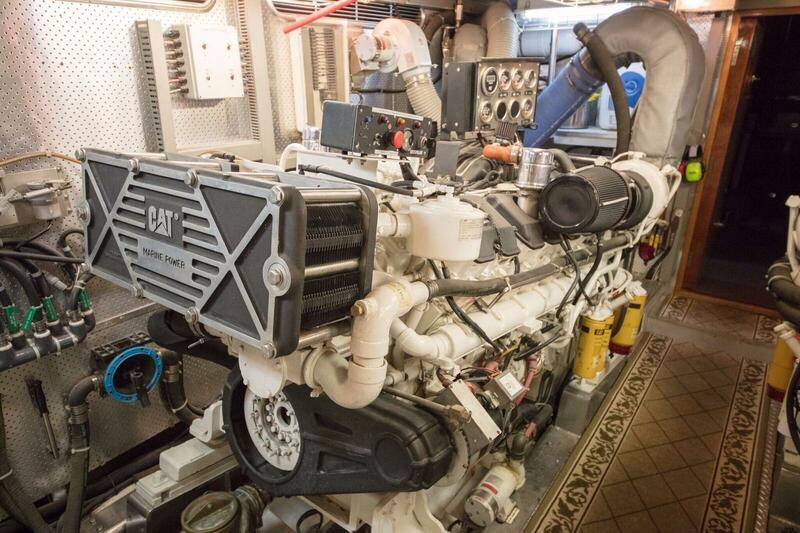 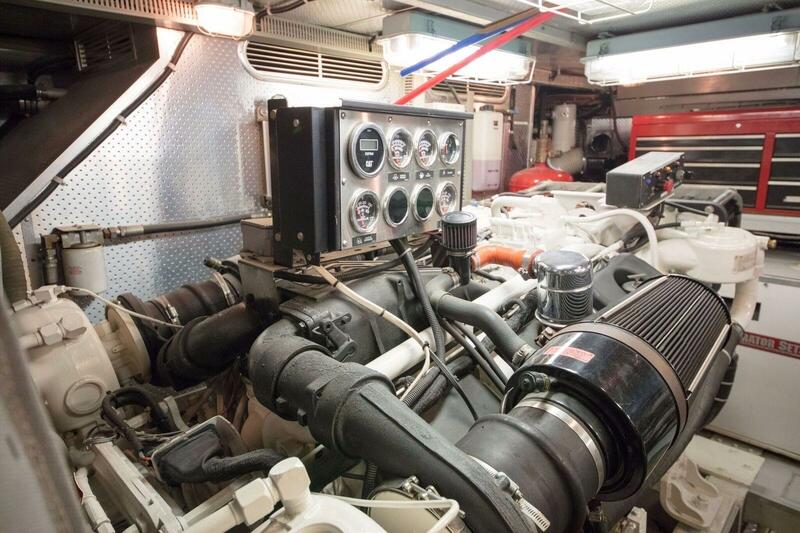 BELISARIUS has a beam of 6m (20ft) and a draft of 1.9m (6.2ft), the yacht is powered by twin CAT 1400hp engines with cruising speeds of 16 knots and top speeds of 20 knots. 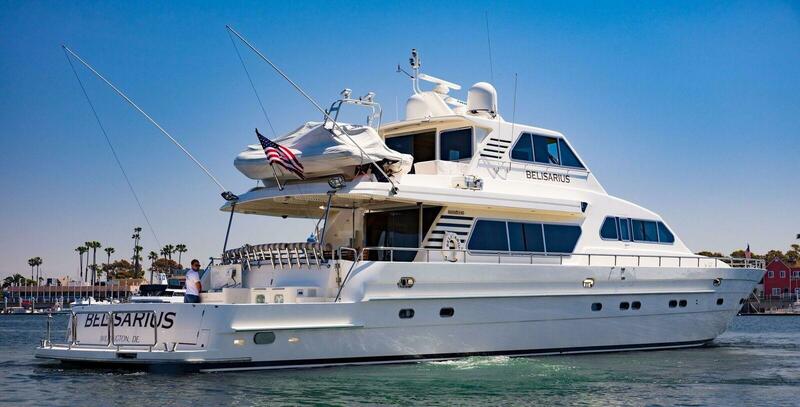 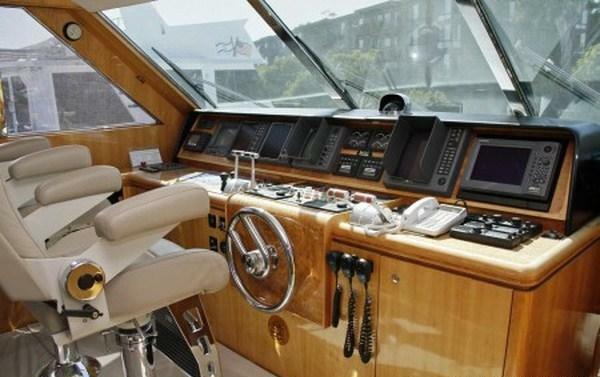 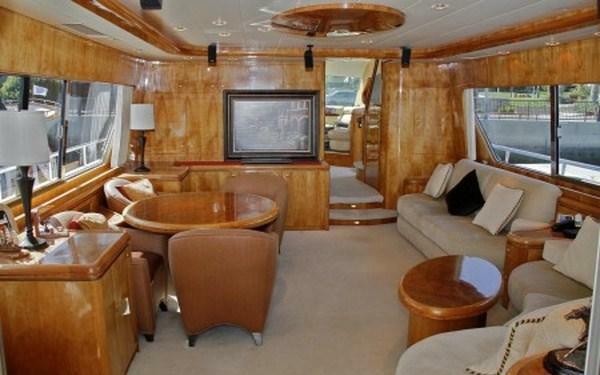 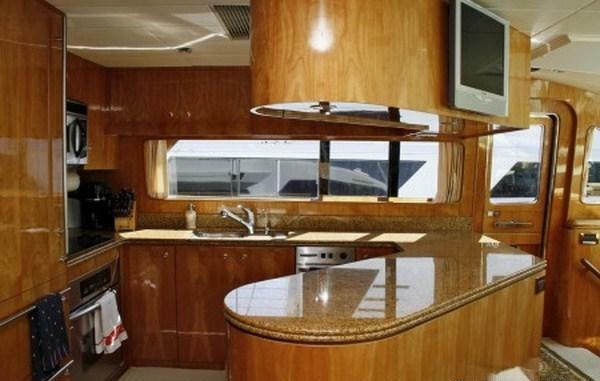 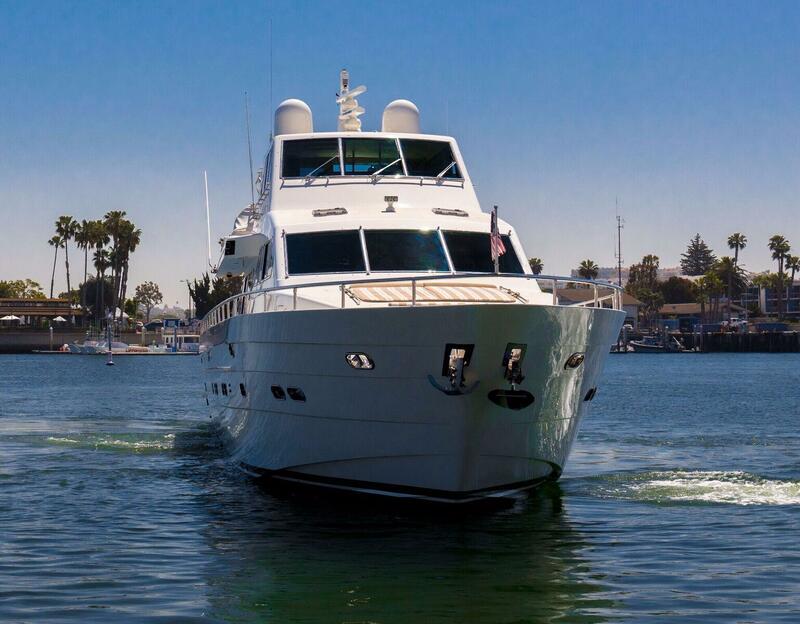 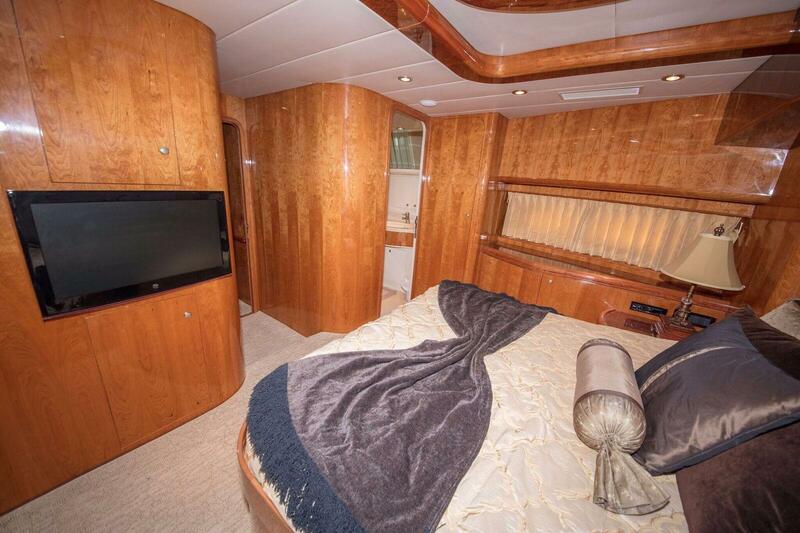 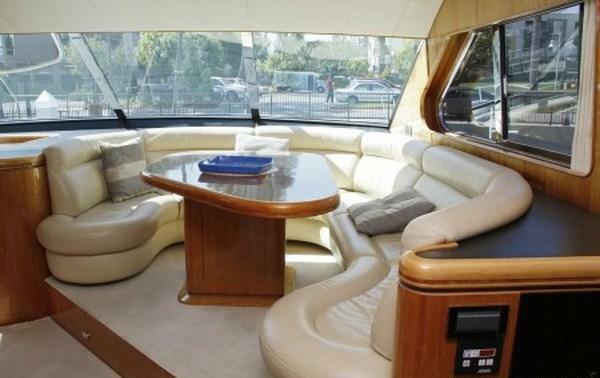 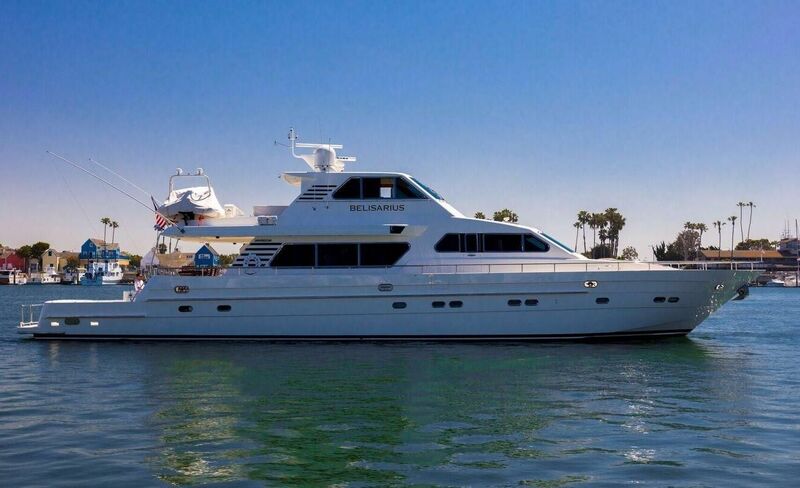 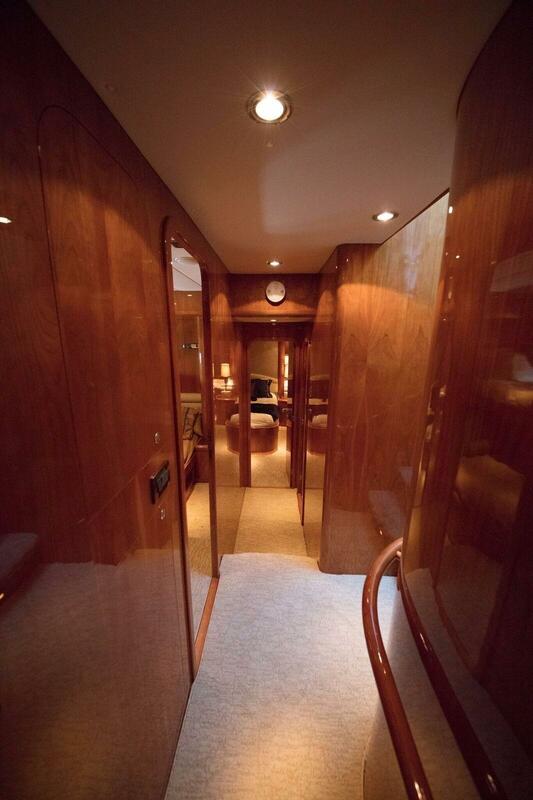 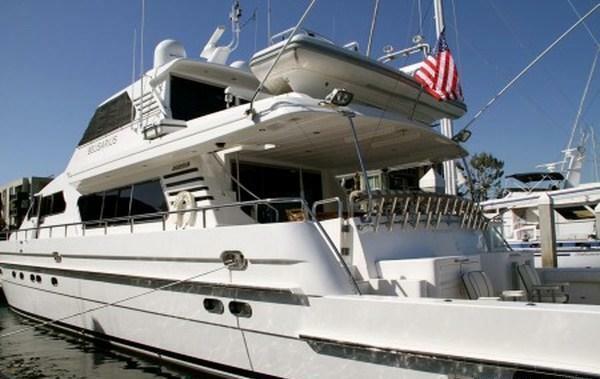 Luxury Horizon motor yacht BELISARIUS can accommodate up to 6 guests in 3 en-suite cabins. 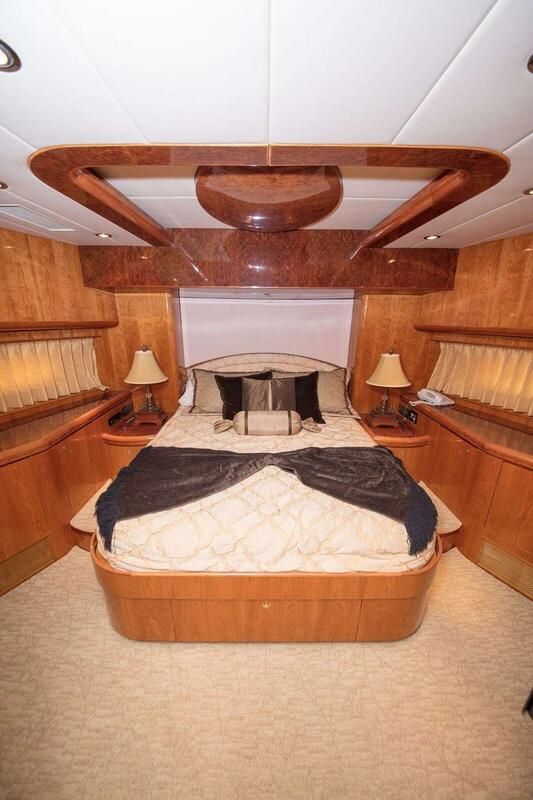 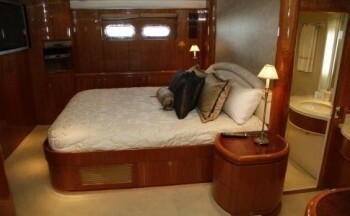 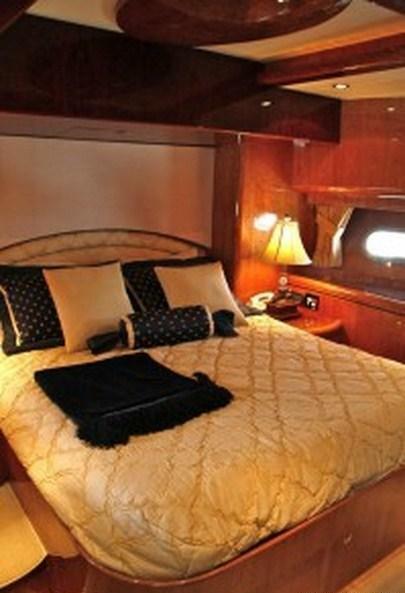 The master stateroom is amidships and full beam of the yacht with a king size bed, cocktail table, walk in cedar lined wardrobe, 42’’ TV and en-suite facilities with shower. 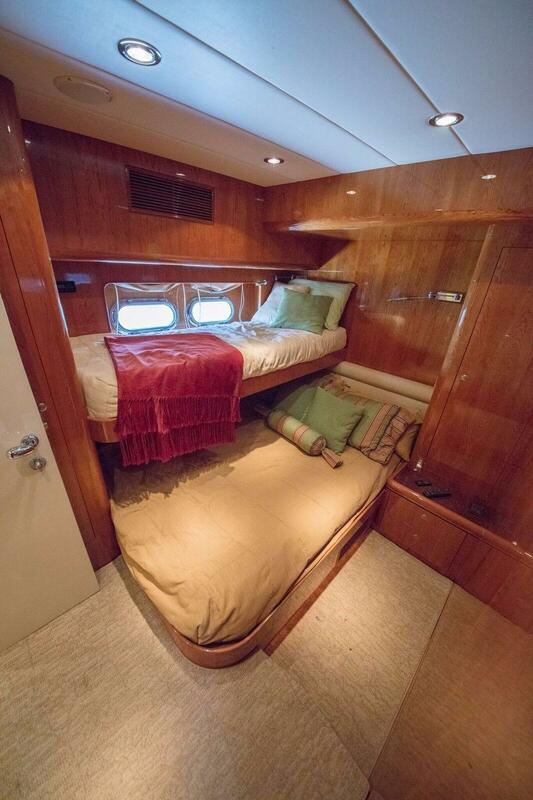 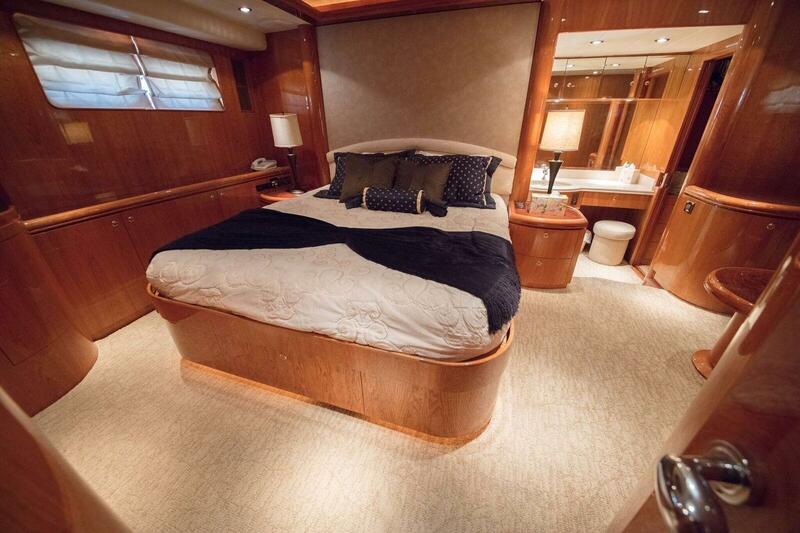 The VIP cabin is forward and full beam of the yacht with a queen size bed, 2 cedar lined closets, 26’’ TV and en-suite with tub. 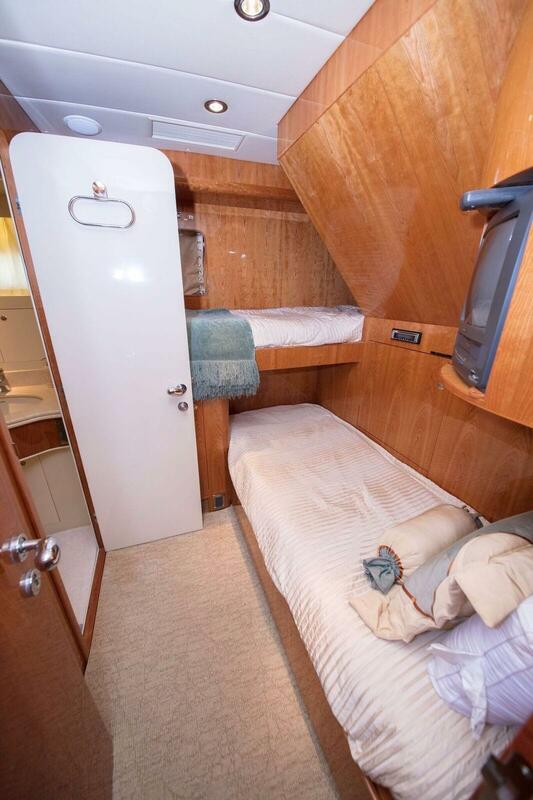 A guest cabin on the starboard side offers a queen size bed and upper Pullman single bed and en-suite with shower.